An earlier blog talked about exotic species of trees that have been planted in Delhi as a result of planned actions by British. Subsequently trees planted by MCD (Municipal Corporation of Delhi) on minor roads are not so well planned. Do these trees have any use in cities? Here is my observation. Delhi as a city has these very interesting weekly phenomenon, like all major cities in India. Every locality has a dedicated day of the week where there is a weekly market held that usually starts around 5 pm and goes on till 8.30 or 9 pm. It usually coincides with the special day dedicated to the local deity to be visited by the local communities. On this day the formal shops selling things are closed and the footpaths and sides of the roads are occupied by the informal traders selling vegetables, fruits, clothes, kitchen items, trinkets and toys etc. Walks through various local market places and shopping area in Delhi have an interesting story to tell about trees that were planed by MCD. The physical characteristics of the trees like the size of the trees, the size of the leaves, the shadows they cast, the height they grow to within years, at what level they branch into major branches are all interesting determinants of the kind of trade that takes place under their shade. The low branching trees with small leaves allows for better light for displaying goods to be sold in the weekly market. For example the need for display and advertising their clothes and light goods made of plastic for a small informal trader is met perfectly by such low branching trees. 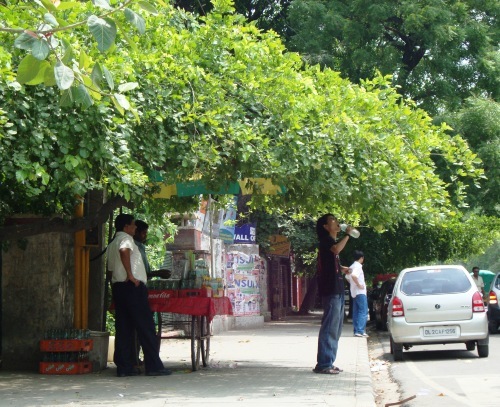 The more dense leaved trees with slow growth and with columnar roots like Banayan trees are usually housing local ‘small’ informal mechanics hosting motor repair shops, for auto rickshaws and scooters and even cycle rickshaws. The snack foods trades like soft drinks, fruit juices or candy ice-creams or chaat etc. are located near a flowering bougainvillea compounds with pink flowers right through summer. Thinly canopied, but seasonally blossoming tress, like Gulmohar or Laburnum /Amaltas or Copper pods, house small traders selling nick knacks like tamarinds, raw mangos, and sour lemon candies, after school hours outside schools. On a more regular basis during late evenings, are eatery stalls, targeting people returning home from work. They take a break, shopping on their way home, stopping by to have a snack, before dinner. These stalls sell pakodas, Dosas, Vadas and Idalis and more recently Momos. These stalls usually have a small board advertising their MCD certification, framed and hanged on the side. Then there are more substantive Chinese noodle corners or kebab corners with a small roof and a counter that caters for teenagers and young adults, as a hang out places. These snack joints prefer tall fast growing trees like Neelgiris, Acacia, silk cotton, near the road side where two wheelers and small cars can be parked easily.